First-time divers sometimes fear being claustrophobic or encountering deadly marine life while in the ocean (among many water-based fears! ), so at Fit Bottomed Girls we asked an array of experts on how to make your first scuba lesson safe and enjoyable. 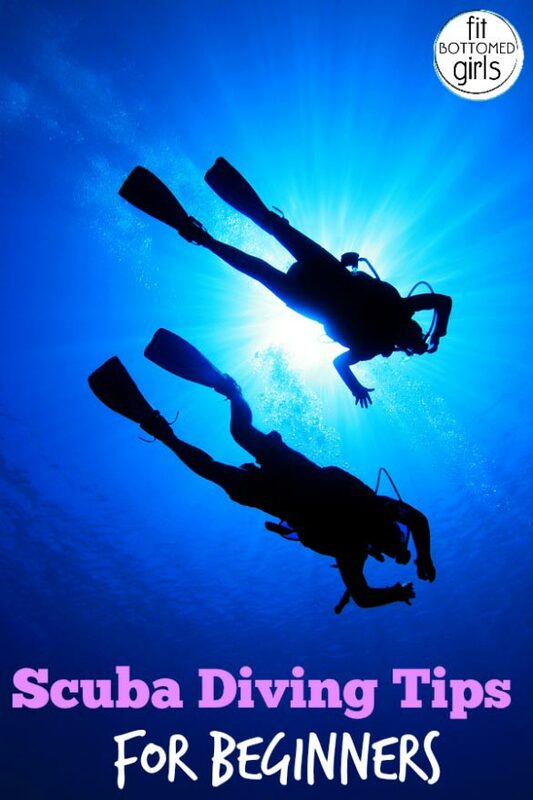 Now get ready to dive into these scuba diving tips for beginners! My first tip is to relax, and take a deep breathing class. Scuba diving is all about breathing. Courses are designed to take you slowly through the process of diving, so you don’t even go near the water the first few days. You’ll start with several days of classroom lessons and familiarizing yourself with the equipment and safety aspects of diving. Then you’ll work your way up to pool lessons where you’ll get comfortable with having the gear on and using it underwater in a safe environment. Don’t worry about sharks or other marine life. A strange thing happens when people become divers, they go from worrying about seeing sharks to being disappointed when they don’t see them. When you dive with top predators you get the joy of entering their world, watching their lives unfold with all their quirky behavior and personalities. It’s extremely rare to encounter sharks unless you go on a specific shark dive. But when people do encounter the rare “wild” shark, they always seem to surface with a huge smile and the feeling they just shared a few moments with a magical creature. When you are descending always equalize (clear) your ears as often as needed. It’s okay if you overdo it, but is NOT okay if you don’t do it enough. There has to be no pain and no discomfort at any moment. If there is, you have to stop your descent, go up to a shallower depth and try the ear-clearing technique again. Learn how to kick underwater properly. When you are doing underwater exploration for the first time, kick with your legs straight; start your kick using your hips not your knees. Don’t wear jewelry. Besides the obvious that rings, bracelets, etc., are more likely to come off in the water, it could attract unwanted attention. There are several fish species that prey on smaller silver fish. Jewelry can be mistaken by these fish as prey and cause them to act aggressively. A healthy respect and precautions like these make diving with these incredible animals safe and fun. If you have long hair, tie it up. Stray strands can cause your mask to be unable to get a good seal. There is nothing more annoying than having a leaky mask on your dive. The mask strap should sit on the crown of your head, so I would recommend a low ponytail or very high bun. Good underwater form means not using your arms. Keep them still and at your sides. Your power comes from your legs. You’ll start with a straight leg and will likely evolve to a frog-style motion because it disturbs less sediment below (needed when you’re swimming right above sand). Perhaps the best exercise with scuba is shore diving. Typically, you’ll swim a short piece on the surface, when you’ll want to use your snorkel. Take a few long, relaxing breaths before descending. Use a dive compass to find your way back. Navigation can be tricky, so don’t be afraid to use landmarks in nature — coral and rock formations, please, not eels or sleeping turtles — to help you remember your way. When I was just starting out, I would lay out little rocks in the sand pointing the way back to my starting point. Everyone starts somewhere! Another tip: bring a GoPro to get good photography of the reefs! My wife and I might go scuba diving for our first time soon, so thanks for the helpful tips. I like your point about always equalizing the pressure in your ears as often as needed. We’ll be sure to resurface if we feel any discomfort or pain and try it as many times as needed.